Day 28 of WDW-40, the latest of my Disney Trip Reports, is here! Today is the final full day of our 2016 trip to Orlando, and we get to spend it at Magic Kingdom, celebrating the 45th Anniversary of Walt Disney World! We were up the brightest and earliest we could possibly be this morning so that we could check out of Animal Kingdom Lodge: Kidani Village, leave our luggage with Bell Services to transfer all of our cases to our next Disney Resort – Saratoga Springs Resort & Spa, and get over to Magic Kingdom for the 45th Anniversary rope drop! We parked and took the Monorail round to the park entrance and had a beautiful sunrise to welcome in this landmark day in Walt Disney World history! By around 7:30am we were through through the turnstiles and security and waiting in front of the Magic Kingdom Railroad Station. Everyone was handed an special anniversary park map and a badge as they entered the park which made great free collector’s items. The park map opened up into a poster of the logo that you can see in the banner in the above photo. I had heard that they had badges at Contemporary, Fort Wilderness, and Polynesian, as they were celebrating 45 years too – but we sadly weren’t able to nab those. 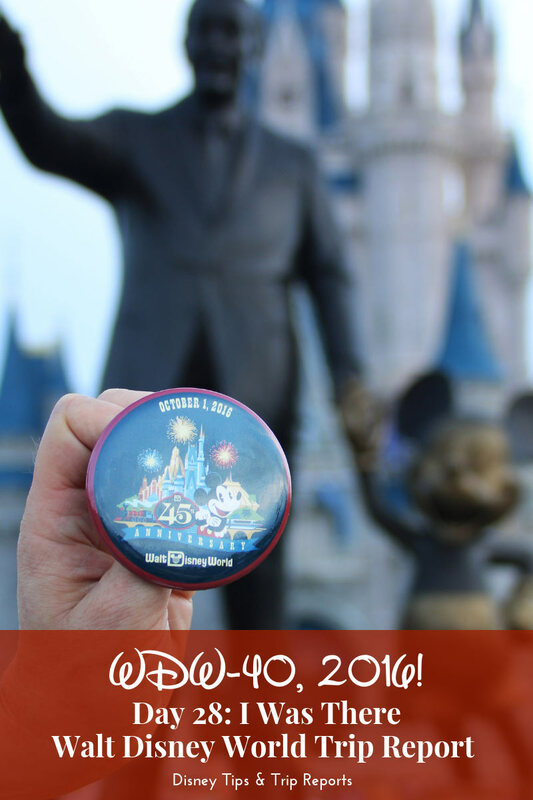 Would have loved to have got a badge from Poly as it is our DVC Home Resort! Eventually the rope drop show began – it’s been a long time since we’ve actually been at Magic Kingdom early enough for rope drop! The last time was back in 2011… I think the opening is pretty much exactly the same (although it’s now on the Castle Stage I believe) with the train rolling into the station bringing Mickey, Minnie, and a host of other Disney Characters. A family is selected to help open the park, and what an awesome honour for the family chosen for this special day! The crowd then counted down from 10 to 1 with some fireworks bursting into the air before we were finally allowed into the Magic Kingdom. There was very little said in advance about what (if anything!) would be happening to celebrate. We actually added an extra day to our holiday a few months after our initial booking, so that we could be in Walt Disney World for the 45th Anniversary. People were already staking their spot in front of Cinderella Castle, so we made our way down Main Street USA to grab ours. While waiting, Steve went and bought a Mickey Pretzel ($6) and some coffee for our breakfast, and we waited for the festivities to begin! There was some limited edition merchandise being sold in the Emporium, which would have been cool to buy – but the line was already out of the store and down most of Main Street! They had only one door open to the store, and I did hear that some people waited as long as 7 hours! Whether this was true or not I don’t know – but yikes! The merch included a very limited quantity of pins, Vinylmation (different to the one we got below), and t-shirts which said “I Was There” on it – hence the title of today’s report! Later in the day we did pop in and bought a 45th Anniversary Vinylmation Mickey Mouse Figurine and some blind boxes of anniversary pins. We had already bought some 45th merch on our last visit to Magic Kingdom. At around 9:30 am, guests were welcomed to the Magic Kingdom to celebrate the 45th Anniversary, then the big wooden doors opened at the back of the stage… Out walked what must have been about 50 Disney Characters to cheers from the crowd and Zip-a-Dee-Doo-Dah playing, as a Disney fan I couldn’t help but shed a happy tear! Let’s see… there was of course the big 5 – Mickey, Minnie, Donald, Goofy, and Pluto; and of course Daisy, and Chip ‘n’ Dale too. There was Peter Pan and Wendy, Princess Jasmine and Aladdin, and the Genie; Belle and The Beast, and Gaston; Sleeping Beauty and Prince Philip; Cinderella and Prince Charming, and the Fairy Godmother; Tiana and Prince Nazeem; Ariel & Prince Eric; Rapunzel and Flynn Rider; Merida; and Snow White with Dopey. Mike and Sully from Monsters Inc were there, and some of the guys from Toy Story – Buzz, Woody, and Jesse. I can see that Alice and The Mad Hatter were there, and so were Judy Hopps and Nick Wilde. I think some of the Country Bears and some characters from Song of The South were there too. Ooh, and I’ve been watching our video back and see Stitch on the stage! As the song came to the climactic ending, this happened…. The celebratory banner – which should have unfurled showing the artwork for the 45th anniversary – didn’t! Lots of gasps, and “oh nos” were heard from the crowd – including myself! To think a machine as slick as Disney could have something as simple as this go wrong! They left it in its sorry state until the end of the stage presentation, and after that it seemed to be a real struggle for them to undo the other side so that it could hang down. So, if you see any photos online with pictures of it down with characters on the stage, they have been Photoshopped!! Then to add insult to injury with the banner situation, it wasn’t even left up all day! They literally took it down about 10 minutes after the stage show ended! Anyway, back to the proceedings where Walt Disney World Resort President, George Kalogridis, gave a speech, talking about Walt Disney’s legacy, and about the opening of new lands (Pandora – now open; Toy Story – ditto; and Galaxy’s Edge – 2019) as well as more to come before the Walt Disney World Golden Anniversary in 2021. Then Cast Members dressed in various different costumes from around the parks, entered the stage and sang a “21st century take on a classic Disney favourite” – When You Wish Upon A Star. I was not a fan of the arrangement – it just didn’t seem to fit the song right. As the song ended there were of course fireworks, and huge bunch of streamers fired out into the crowd. I was all primed for the perfect shot, and then some bloke walked right in front of me – argh! A once in a lifetime thing, and… who does that? !